SAVE ACE Preserve from the Land Grab! of the FIU Bridge Collapse at the FIU South campus. Remember to Share and ask friends to sign. Please don’t take other actions at this time out of respect for those who are mourning the loss of friends and family. We will resume actions at a fitting time. Sign & Share the Petition – Click HERE. Please Call Gov. Scott NOW to SAVE ACE from FIU! * Always be polite and clear. * Do focus on the safety of the ACE Community. 1. Please protect this community from FIU. Bill HB 215 includes a statute which will endanger the safety of 1,000 families and hurt their private property values by taking away their city’s right to protect them and their local Environmental Preserve. 2. “VIOLATION OF LEGISLATURE SINGLE SUBJECT RULE! PLEASE VETO HB 215, ENGROSSED 1. Florida Legislature operates under ‘single subject’ rule. An amendment, offered on HB 215 (and failed on multiple other non-related legislation) has passed. This amendment sponsored by FIU, has nothing to do with defining AutoCycles. It creates a vehicle road that would go through a designated nature preserve and opens an alternative thru road to the University for thousands of cars in a residential community with a passive park median. Photo: Residents of the ACE Neighborhood meet to discuss stopping FIU from taking their Environmental Preserve and their Street. Voting has completed in the Florida Senate (3/9) and House (3/10). Note: this website will be updated constantly as new info becomes available. Latest update: March 10th @ 3pm. FIU claims they need to steal the Preserve for “Student Safety”. North Miami Police Chief Kenneth Each (Retired) said this is “nonsense” on the March 5th Townhall Call. Listen to his statement here. 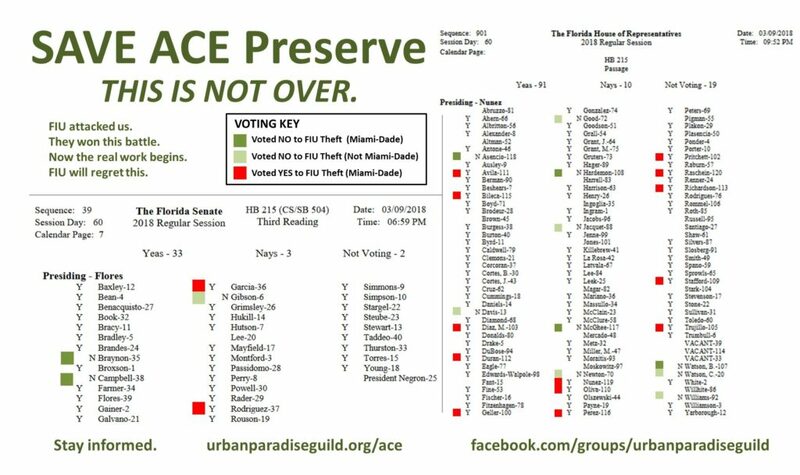 This is the 4th time that FIU has attempted to steal ACE Preserve. This bullying has to stop. The Senate and House both approved HB215. Section 334.352 / Lines 248-260 of the Bill. Now it goes to the Governor to sign. Please see the top of the page. Please stand by. Join us. Plan with us. Take the ACE Survey: What do YOU think the Preserve needs? Click HERE! ACE Volunteer Opportunities List HERE! ACE Project is a PSC Grant WINNER! UPG is honored to be selected as a PSC Grant Winner! We will transform part of Arch Creek East Environmental Preserve into Native Habitat where the community can be immersed in nature while they walk, bike, dog-walk, meditate… there will be Nature Trails, interpretive signage, and a young forest we shall protect and nurture. Supersize this project? Yes, Please! Being a PSC finalist catalyzed much bigger impacts: The City of North Miami is pledged substantial funding, allowing us to triple the project scope to around 1.8 acres! Big THANKS to NM Councilman Scott Galvin for his strong support – past, present & future – and to NM staff who are working with UPG to carry out our plan. 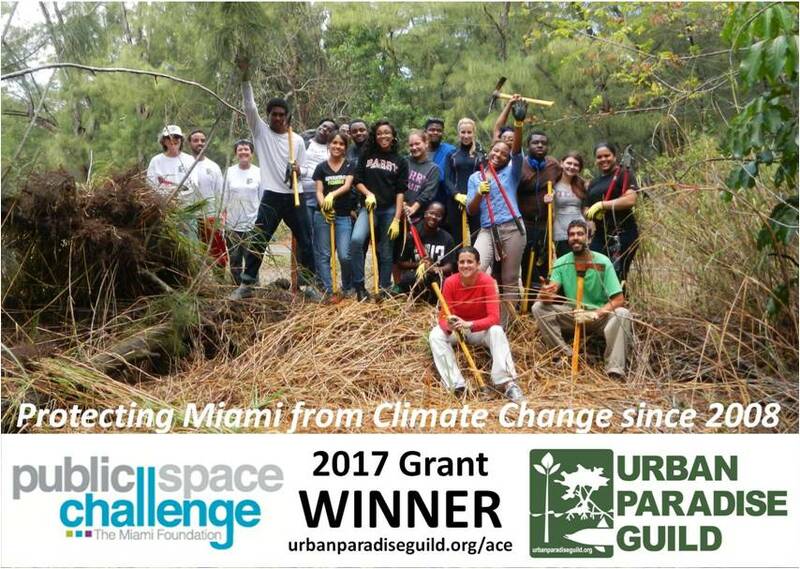 We are very grateful to our many Partners who are helping us build our TREES program, especially Emerge Miami! Thanks to our friends at Miami-Dade County Parks ,we have a thriving nursery growing trees for this project. Miami Dade College has been a wonderful partner, and Institute for Civic Engagement and Democracy – Miami Dade College has pledged continued support. ACENA – Arch Creek East Neighborhood Association will be bringing neighborhood volunteers out! Hats Off to UPG’s amazing Volunteers! UPG has been working at ACE for 4.5 years. Volunteers have been working there almost every week, month after month. They conquered Burma Reed. They planted mangroves. They took out Australian Pines, Brazilian Peppers, Air Potatoes, Oyster Plants… and they planted several Demonstration Habitats. Their hard work showed the City and the Foundation what is possible. This project fulfills goals of the Miami-Dade County Open Spaces Master Plan. It is the only PSC Winner in North Miami or NMB. Moving forward, we seek NEW PARTNERS in the NM area… Students will experience our award-winning Service-Learning, and earn service hours. Faculty will find Experiential projects to compliment their classroom content. Community groups will help create transformation. Faith-based groups will find new paths to stewardship. Bike groups will create a new oasis. Nature groups will help make life possible for generations of wildlife! We will all work and learn together, and it is all good! This is UPG’s second PSC Grant (our first was in 2013 for Amelia). It is our third time being a PSC Finalist. We truly appreciate the confidence and support of The Miami Foundation and Foundation Funders for our vision, creativity… and our work ethic! This is our *original* concept. It is 3x bigger now, thanks to North Miami! Read all about it: Click here! ACE (Arch Creek East Environmental) Preserve is a City of North Miami Park. It is located along Biscayne Bay, between NE 135th Street and FIU Biscayne Bay Campus. A picture is worth 1,000 words… so here are photos plus video! Manatee Video ~ ACE Preserve 7/12This young Manatee is still relatively small… just about 6' (2m) long. by Volunteer Gaby Mendoza – Thanks! Photos: Please visit our UPG Facebook Group, and search for “ACE”. You will find many photos of UPG Volunteers making progress… and of Nature!